Trust is a hot topic these days. We sometimes forget how many flavors it comes in. There is the Edelman Trust Barometer, a periodic survey of public opinion about institutions and business sectors. (There is also its tweetin’ cousin TweetLevel, which includes a trust component for your twitter handle). There is no end of advice to the lovelorn about whether you can trust a love-interest. Reputation Garage is one of many companies who talk about trust and reputation in companies. You can even buy “trust me…” t-shirts for your dog. But there’s one sense of trust that we don’t talk enough about. I’ll call it “social trust,” and the person who arguably Wrote The Book on the subject is Francis Fukuyama. The book, published in 1996, is titled Trust: The Social Virtues and The Creation of Prosperity. The book is well-known in academic circles, but not enough in business and public dialogue. 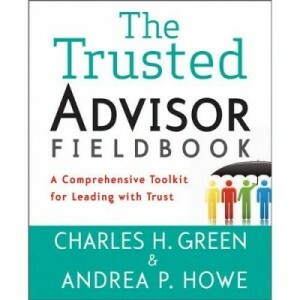 I often hate it when people say this, but: if you’re going to talk about trust, you need to have read this book. The expectation that arises within a community of regular, honest, and cooperative behavior, based on commonly shared norms, on the part of other members of that community. Although it involves an exchange of information, trust is not reducible to information. The greatest economic efficiency was not necessarily achieved by rational self-interested individuals but rather by groups of individuals who, because of a pre-existing moral community, are able to work together effectively. One of the most important lessons we can learn from an examination of economic life is that a nation’s well-being, as well as its ability to compete, is conditioned by a single pervasive cultural characteristic: the level of trust inherent in the society. The entire imposing edifice of contemporary neoclassical economic theory rests on a relatively simple model of human nature: that human beings are “rational utility-maximizing individuals.”… But everyone of the terms of the neoclassical premise is subject to significant qualification or exception… between 40 and 60% of those [in an experiment] contributed altruistically to the groups well-being. The only exception was a group of entering graduate students in economics. If you think this sounds like dry stuff, then read on to the part where he talks about high-trust in low-trust cultures. And he names names. 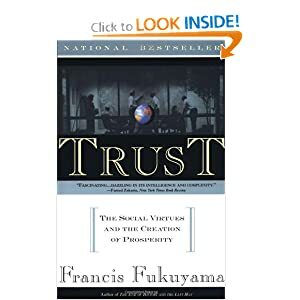 The French, for historical reasons Fukuyama explains, have trouble trusting peers: but they are very good at trusting central authority, hence have very competent national institutions and companies. The Chinese, on the other hand, have a largely familistic society, which stresses family bonds over other social loyalties. This explains not only why there are few Chinese companies with global brand names like Wang laboratories, but also the reason for Wang’s dissolution–An Wang’s inability to break the chain of family management. In contrast to familistic trust in countries like China, Italy, and parts of France, Fukuyama highlights high trust societies like Holland, Sweden, and Switzerland–small countries without classical economic scale, which nonetheless host major global corporations. Much of the book rebuts the surface idea that individualism in the United States was responsible for the US economic success. Going back to 19th century Toqueville’s work, he makes the distinction between a government-focused society (which the US never was), and a collaborative society–which the US historically always has been. These same Americans who are against state regulation, taxation, oversight and ownership of productive resources can be extraordinarily cooperative and sociable in their companies, voluntary associations, churches, newspapers, universities, and the like Americans say they feel a strong distrust of “big government,” but they are good at creating and maintaining a very large, cohesive private organizations; they pioneered the development of the modern hierarchical (and later multinational) Corporation, as well as the huge labor unions spawned by them. The real challenge for us today–and he identified it 15 years ago–is whether US society still maintains that collaborative instinct, or whether it has been washed away by greater levels of divorce, economic inequality, assertion of individual rights, business ideologies built on competition, and a press increasingly dependent on sound bites. I read this book many years ago, and have gotten even more out of it on re-reading recently. My Kindle software supports digital yellow highlighting, and this is one book which is now half-yellow. A new integrated program for delivering Trusted Business Advisor training.